Sealed VRLA (Valve Regulated Lead Acid), these batteries feature AGM (Absorbed Glass Mat) technology for complete, maintenance-free performance. No more gassing. No spills. No damaged equipment. 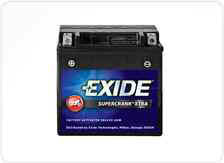 These batteries fit domestic and imported motorcycles and scooters, as well as personal watercraft, ATVs and snowmobiles. Increased plate-to-cell compression improves vibration resistance and product durability for longer life. Totally sealed to provide maintenance-free performance. No water to check, no spillage, no leaks – under normal operating conditions. Gas recombination technology ensures low self-discharge rate and higher capacity output. Heat-sealed case and cover adds strength and rigidity for longer life. Absorbed Glass Mat technology provides you with “total maintenance-free" operation.